How about a fun little card and a simple technique today? When I was at the Copic certification class this past July, Marianne demonstrated a couple of textural applications for Copic blender fluid, one of which fit perfectly with the stamps I chose for this week's CPS 92 Sketch. I chose PaperTrey's Pure Poppy and Vintage Ivory cardstock, paired with Stampin' Up's Always Artichoke cardstock for the base and card layers, and then stamped backgrounds using Polka Dot, Scratched Grid, and Leaves Backgrounders (Cornish Heritage Farms), as a backdrop for my focal image. 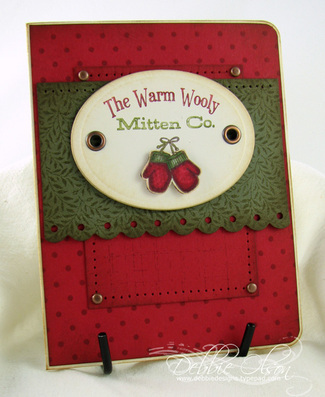 For the focal image I paired CHF's Winter Vintage Signage set with Karen Lockhart's Itty Bitty Mittens. 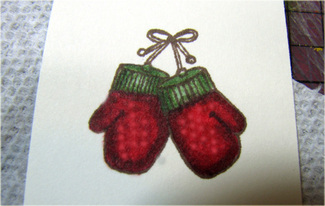 Now, for the fun part: the mittens that I had colored with my Copic markers, pictured here along with a refill of clear blender fluid, looked just too smooth for mittens. They needed some nubby texture. 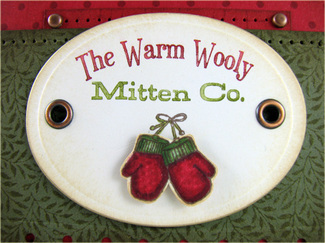 After cutting and embossing the focal image with a Spellbinders Classic Oval die, I cut out the mittens and mounted them on foam tape to add a bit of dimension. I was pleased with the texture that the clear blender fluid and paper towel added. If you are experimenting with Copic markers, go find some interesting textures--burlap, gauze, terrycloth--anything absorbent and interestingly textured. Try it! It's simple and really adds something to the right image. Please note: subtractive texture works best on medium to dark marker values; it needs contrast in order to show up. 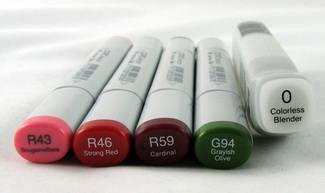 Also, if you are interested in learning more Copic techniques, you would find Marianne's blog extremely helpful, as she explains the ins and outs of Copic marker techniques. Thanks for visiting, and have a lovely day!